Code snippets are ready made, which means they are really useful reusable codes which need to be used and then again used at someother part of work. These snippets are not really of the type which are only used by just placing a cursor and inserting it to the place you want, but some are surrounded with code snippets also in which some line of code has been selected and then surrounded with required if statement, for loop and so on. It saves a lot of your time by saving reusable code in code snippet manager and you can later use it anywhere. It increases productivity by simply inserting code in you desired location. It reduces the chances of less error by re typing your line of code. It helps to stream line your work as per you assigned deadline. Firstly, you can check a whole list of code snippets in code snippets manager which you can open by pressing Combination of (Ctrl + K, Ctrl + B). There is another way to open as introduced in latest versions of visual studio which is very beneficial to open the menu items in less time; it is the Quick Launch Search Box Displayed in Top Right of your Visual Studio IDE. 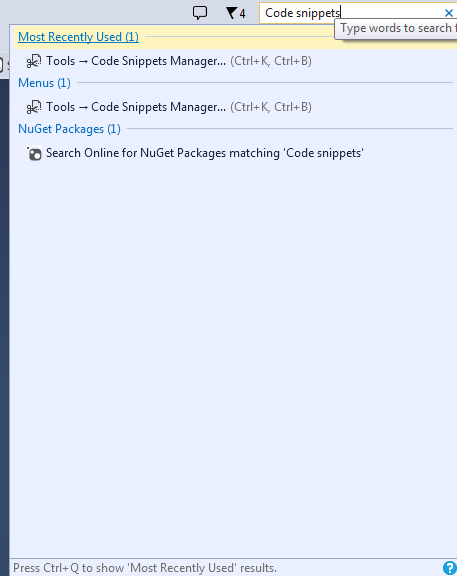 As you type text it gives you suggestions and suggestions to do more actions also, like it displays the most Recently used items and Nuget Package Manager search for the searched keyword. Basically there are two types of code snippets to be used; First one is by placing cursor at location and typing some code snippet code and secondly by using surround-with code snippets. Note: At any time if you do not want to select the desired code snippets Press ESC Button it will dissolve and does not insert the code snippet. Usage of code snippets is very simple. Just place cursor at the desired location where you want to insert code snippets, type snippet code and Press TAB Button Twice to insert in the place… we will discuss full list of code snippets in this article after following this but for reference I am quoting here an example of code snippet… for example you want to add for loop, just write for and press twice to check the magic of code snippet inserting and with full syntax and with default values. It Increases your productivity and time by also reducing the risk of human errors while creating complex syntax like for loop. You can use it from Keyboard shortcut also by pressing key combination of (Ctrl + K, Ctrl + X) and select the Visual C# Category. But if you have to remember the snippet code you can type it. You can use surround with code snippets by selecting the line of code and press keyboard short cut key combination (Ctrl + K, Ctrl + S) and type the desired code snippet to wrap in the line of code. 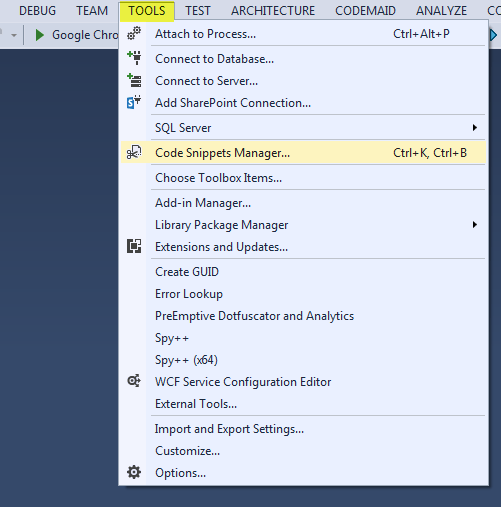 Now we will move into the using of code snippets inside IDE. Region directive is used to define certain region in the code which specifies certain functionality or scope of certain work. It is collapsible portion and it is useful for pages which has lengthy code written so that you can collapse the region of code and focus on your work. The start #region must be terminated with #endregion directive otherwise it will through the exception. #region has a scope of anywhere means you can insert it anywhere you want. This code snippet has scope only in class as class has destructors. 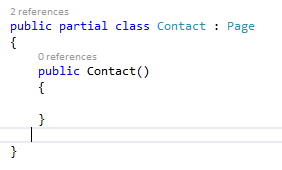 As already mentioned that has scope with in class so I checked it with creating outside the scope of class, although it created as it is snippet but it will generate compile error or a namespace cannot directly contain members such as fields or methods, while the other one inside the class scope did not through any exception. This code snippet is used to create constructor of a class. It has also scope within class otherwise it generate exception. Type ctor and press TAB twice to insert. This snippet will create a declaration of class. It has a scope of namespace (global), class or struct. This is used to declare enumeration. This is used to build a list of distinct enumerators. It has a scope of inside namespace, class or struct. The default value for initial first enumerator is 0 and the successive items will follow it like 0, 1 and so on. Enums cannot contain whitespaces while declaring their names. The approved types of enum are int, long, byte,unit,ulong,ushort,short and sbyte. Very helpful snippet cw means Console.WriteLine() which can show current line terminator to the output stream. Its scope lies inside method, indexer, property or event accessor. The Equals as the name defined it has behavior to check equal of two objects either they are of same type or of different type and it returns Boolean value, if matched it return true otherwise false. Its scope lies only inside class or struct. Creates a declaration for class that derives from exception by default. Exceptions are errors which are generated by the application. Its scope is inside a namespace, class or struct. for statement is most probably used to run together block of statements in a repeated fashion until you statements return false. The best possible scenario for using for loop having you know number of iterations required to get possible operation. foreach iterates through for each element in an array or object collection that implements IEnumerable or Generic IEnumerable Interface. It just iterate to the collection of items but it does not for adding or removing items. you can use break and continue operation inside foreach loop as per your easness. this code snippet is for decrementing values after each iteration using for loop. Its scope is as same as for loop. it is the most important and too many used code snippet in daily work routine. due to its simplicity its as important as you think you have to include for every block statement to check for. It has scope inside a method, indexer, property or event accessor. by default it has true value like we are checking for check box which is either checked or not so that we can evaluate the if … else condition on the base of it. by inserting this snippet it create the interface declaration. an interface only contain the signature of methods, indexer,events pr properties. a class which implements the interface must used the members which interface has defined. An Interface can inherit from one or more base classes. it has scope inside a class, struct or namespace (global). it declare a scope / set of related objects. inside a namespace you can declare one or more namespace,c lass, struct, enum, interface and delegate. it has scope only inside namespace which has global scope. prop: it created auto-implemented property inside a class or struct.you can initialize certain properties with some initial value. propfull: it can create property declaration with get and accessors and it has scope only inside a class or struct. It is a control statement which selects a switch section and break no succeeding section should be checked. each switch section contains one or more case labels followed by one or more statements depending on the scenario. create a try….catch block. 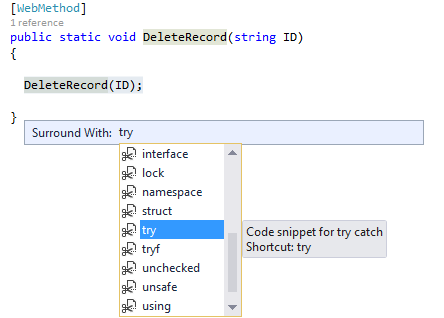 the most important purpose of try … catch is to catch unhandled exceptions by trying a block of code and it successful it moved to the next section or move out of the method block and if not successful it go to the catch section where customized as well as other exception are thrown to identify the type of breakage caused by the try code. It executes block of statements until the expression is not set to false. The executing statement can also be terminated by adding break, go to like statements. It has scope inside a method, indexer, property or event accessor. That’s all about some of the useful code snippets but there are some others; you can check full code snippets manager for full list. Before going into the detailed description of each status codes we need to understand some definitions which are necessary to fully understand the terms used in this context. HTTP is a stateless protocol means (the request which client generated must have some response from server and no data reside on server while processing both). Http Follow client-server approach as client send request from browser and in return server response. For every request you send to server you have to wait for response that browser shows in the form or HTML. HTTP consist of Headers, Cookies, DNS Prefetching, Response Codes, Request Methods and Access Authentication. We Will discuss in detail about the main backbones of HTTP Request-Response Model. There are several versions of HTTP, but currently HTTP 1.1 is in use. Hope you understand the basics of HTTP, Now Let’s start with the key area of HTTP Request – Response Model which is Http Response Codes. These provide information about certain HTTP Requests either they are completed or not. These are 3 digit codes. 1xx Informational Continue and processing. 3xx Redirection Need more action to fulfill the request. 4xx Client Error The Request contains unknown syntax and server did not fulfill the request. 5xx Server Error The Server failed to fulfill the valid request. HTTP status codes in the 1xx are typically informational. Status codes in the 2xx range indicate that the transaction was received, understood, accepted and processed successfully. HTTP status codes in the 3xx range pertain to redirection. The client must take additional action to complete the request. HTTP status codes in the 4xx range indicate that a problem occurred with the request. Error codes in the 5xx range indicate that server is aware that it has encountered an error or is otherwise incapable of performing the request. Code lens tells us the code changes in a fantastic way and the best thing of this feature is there in editor history which you get before code lens in a lot of time. With code lens you have a deep focus on your code, since you know what last changes were made to the file with reference history and who changed it. Code lens is a combination of References, changes in your code, code reviews, bugs associated with item, unit tests and their detail of what number of unit test passed or failed in a unique fashion. All of the above options you can check while leaving your editor and in page references make life easier, since all of these are associated directly with your code.But wait are you too much excited after readings its indicators, just read the note. Note: CodeLens is available only in Visual Studio Enterprise and Visual Studio Professional editions. It is not available in Visual Studio Community edition. So let’s start in detail about indicators of code lens. You can customize the indicators on / off from Tools, Options, Text Editor, then All Languages and Code Lens. As you can see in the image above the code lens option is enabled by default in the editor. If you are connected to Team Foundation Server or any other version control system you have all the options available and you can customize other specific options. If you want to disable all the options you can uncheck the Enable CodeLens Option and if you want to enable CodeLens, then check the Enable CodeLens and then customize the indicators what do you want to see in the editor. By turning this option on you can see the indicator defining the last test run status and it will show left to the references. By clicking the status icon you can take the test result information. If your code does not have reference, it show 0 References. you can view the code references by pressing (Alt + 2). if your code has references, then you can view them by moving mouse on the top of reference and by pressing double click you can view the reference definition. After the references are opened you can see the information displayed in the form of Parent element contains the File location, followed by definition of method with line number as the child of each page. The Show Tested By option will show the tests associated with your code and the overall status of how many tests associated with number and status of tests run or not. If you have unit test project then this can show the unit test status by giving you value of how much passed, failed with ratio of 1/2 means out of 2, 1 passed and 1 failed and it give you detailed information of unit test with methods and duration in ms (milliseconds). You can directly run all the tests or specific test and can review the test code by pressing (Alt + 3). The tests shown with indicator marks of wrong and correct icon which show who failed or passed. If you see the warning icon then it means you have not run any tests and that way you can run through code lens unit test indicator. To review the test definition double click on the test item. Show author option will able to show you the last author who has changed the file or work in file and check in the latest changes. If there are more than one author associated with your code it shows the last author name like MUHAMMAD AQIB + 2, the count next to the author tells that there are two more authors associated with file. To show this option you can press (Alt + 4) key. 3 Changes. To show this option you can press (Alt + 5) key, by opening the changes window you can see the detail of changes with change set ID, Change set Description, Author Name and Date of Changes. View Diff of Changeset with [Number] – show difference between selected changeset number with earlier changeset number. Changeset Details – by selecting this will show the detail of changeset in team explorer window. Send Email to [Author Name] – this will open you default email program and fill the specific change details in the To, Subject and Body section of Email. If there are some bugs reported with your work items, it will show like 2 Bugs and by opening the bugs detail window it will show you Bug ID, Type, Description, Author and date reported. It will show the related work items with the piece of code just before the code review indicators. 3 work items, it means there are 3 work items associated with the the checked in changes and all are associated work items are related with it. It will give you information about the associated code review with specific method and it will show in the last of code lens indicators as 4 reviews. After opening the review window it will show the Review ID, Type, Title, Author and Date of Review. option and select the show settings for: code lens and after the selection from drop down list it will display Items in other window with options such as indicator text, indicator text (Hovered), indicator text (Selected), indicator text (Disabled) and Indicator separator and then if you require formatting changes, hit OK button and enjoy with formatting colors and applied fonts. You can easily access code lens indicators by mouse and with the keyboard keys. Just point the mouse to the specified indicator and click on it to show indicator options. From keyboard move the cursor to the desired method and press and hold Alt key for 2 seconds and then it give you number option to select your desired option by pressing numbers. 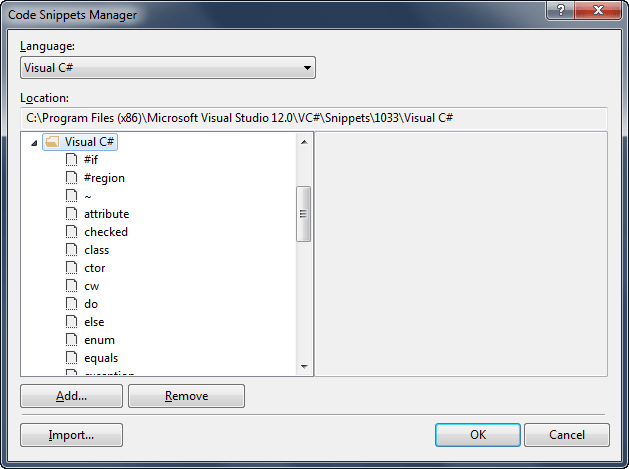 You can also open code lens option from the Visual studio editor. To do so just right click on any one of the code lens indicator and you can see two options. CodeLens options opens the same window which was elaborated at the starting of this article.Hope you enjoyed this article and happy coding with Visual Studio IDE.